The virtual world of NEWTON v4 provides a completely new way of learning physics – the exploration of simple machines, kinematics, dynamics, mechanisms, thermodynamics, electricity and optics on a computer in 3D. NEWTON is ruled by the simulated laws of physics, allowing you to build, manipulate and investigate your experiments interactively, without the limitations of physical models. Actually, you can set up one or more cameras and capture their views of the experiment, storing them in an AVI file. You can also add descriptions to your examples, with explanatory texts, images, and formulas. NEWTON v2 Exploring Mechanisms provides a unique new environment for learning mechanisms and mechanical systems. Select from the wide range of 3D machine elements–axles, wheels, pulleys, gears, racks, levers, cams, screws, transmission belts and more–to discover their working principles. 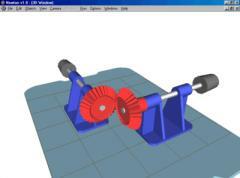 Or study the animated operation of mechanical systems from any viewpoint using Newton’s powerful 3D engine. 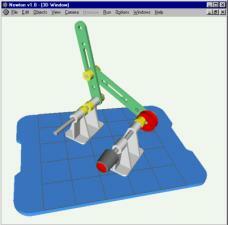 In addition, you can either assemble the mechanisms step by step or watch the assembly process as an interactive movie.